We love the spring/summer season and the new fashion trends that appear with the sun. From the must-have petite dress to bold and brilliant prints and accessories, petite summer style has never been more exciting. When it comes to style leaders, look no further than our favourite petite Instagram influencers and style bloggers, and take inspiration from their petite twist on the 6 key styles that are everywhere this summer. You wouldn’t think that Swedish fashion editor Sania Claus Demina was petite by looking at her legs-for-days in this leopard print swimsuit. High legged one-pieces not only do wonders for mum-tums, but they’re perfect for tricking the eye into seeing extra length. And when she’s out of the pool, try her stunning colour combination of leopard print maxi with pale blue shoes for extra pop! Manhattan style maven Tiffany Jais has also made a great case for leopard print courtesy of her mini skirt – we love the idea of having one key staple piece and keeping all other parts of the outfit minimal. Extra style brownie points for iconic accessories, i.e. her unmistakable Gucci bag. Plus, we barely noticed her burgeoning baby bump, which just goes to show how pleasantly distracting leopard print really is. For everyday chic take a style note from London mum, Abi of stealmystyle40 fame and jazz up your jeans with a silk leopard print cami. Be it petite tops or petite dresses, the off the shoulder Bardot trend complements us petites perfectly. We love how Stephanie Lam has gone for exaggerated sleeves (nobody’s going to notice your lack of height with gargantuan sleeves, that’s for sure!) and Sania Claus Demina has followed the trend in a slightly more muted version. Whether big sleeves or small, show off your shoulders with frills and ruffles, or a string of summer flowers like Monika. The key lesson we’ve learnt from her is to cinch in the waist for a more flattering silhouette, while the overall lesson we’ve picked up from our petite influencers is that going big in other areas is the perfect decoy to our lack of height. 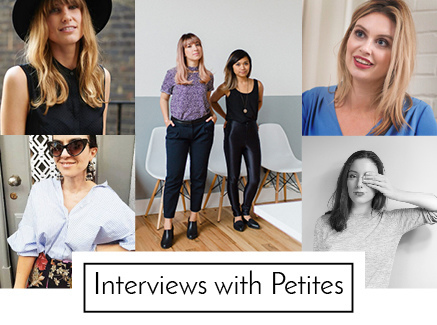 Petites swear by stripes for their elongating and slimming effects, as proven by some of these social media influencers. Abi has embraced stripes in all their glory, and has adapted the trend for summer by going all-out on colour. Side note, we love how her skirt can be dressed up or down – a change of shoes and some eccentric accessories takes it from day to night, while some flats and a leather jacket screams edgy daytime cool. And feel free to go for stripes in any direction, even the dreaded horizontal stripes can totally work – especially for petite frames. Check Kim of LaceandLocks for a great example of stand-out stripe style. White is one of the favourite colours to wear in summer – but also one of the hardest to pull off. It offsets a tan perfectly, and can’t help but make you feel Parisian chic… with a side-dose of spill paranoia. Whether you go for all-white like Stephanie Lam or choose to mix it up, white will never fail to make your outfit pop with a cool, fresh vibe that screams sunny days. A floaty white maxi skirt worn with a simple cami and towering heels is one of our favourite summer holiday outfit combinations…. but keep away from sticky fingers! Often a frightening concept for petites, but once you find the right one, the jumpsuit is one of the most effortlessly trendy pieces of the summer. Wide legged jumpsuits are perfect for petites, and we love the idea of buying a dark coloured one for all seasons, and adding subtle or bold pops of colour along the way. We also love summer-specific jumpsuits too, and like Maxie Elise has demonstrated, they’re perfect when they come in pastel colours and are teamed with your go-to summer accessories. Nice touch on the peek-a-boo top detailing too, as it adds definition and stops her from being drowned by fabric; an excellent style tip for all petites! This season, no other accessory trend has exploded onto the social media scene quite like the circle bag. There are hundreds of styles that we have seen, in all different fabrics, each of them unique and wonderful in their own way. Plus, they seem to be a petite dream, as our favourite petite Instagram stars have rocked them with casualwear to full on eveningwear – to all else-in-between. Adding a round bag to your outfit will immediately catapult you into bang-on-trend.